You are currently browsing the category archive for the ‘American Press Corp’ category. ATTN: Bonini, Reigle, La Mar Gunn, Lawson, Pettyjohn, Hocker, Hudson, Smyk, Lopez, Miro, Ramone, Short, Grey, Dukes, and Collins! Your Candidate Is A Racist and So Is Your Party! You Still With Them? IF SO, Don’t Expect To Stay With Us, You Racist!!!!! Get The Hell Outta’ Here !!! My original plan for this article was to focus on our agenda to help small businesses and entrepreneurs. This week I’d planned to propose new steps to cut red tape and taxes, and make it easier for small businesses to get the credit they need to grow and hire. Because I believe that in America, if you can dream it, you should be able to build it. I’ll be talking a lot more about our economic plans in the days and weeks ahead. But today, I want to address something I hear from Americans all over our country. Everywhere I go, people tell me how concerned they are by the divisive rhetoric coming from my opponent in this election. It’s like nothing we’ve heard before from a nominee for President of the United States. From the start, Donald Trump has built his campaign on prejudice and paranoia. He’s taking hate groups mainstream and helping a radical fringe take over one of America’s two major political parties. His disregard for the values that make our country great is profoundly dangerous. “Poverty. Rejection. Horrible education. No housing. No homes. No ownership. Donald Trump misses so much. The vibrancy of black-owned businesses…Or the strength of the black church… He doesn’t see the excellence of historically black colleges and universities or the pride of black parents watching their children thrive…And he certainly doesn’t have any solutions to take on the reality of systemic racism and create more equity and opportunity in communities of color. It takes a lot of nerve to ask people he’s ignored and mistreated for decades, “What do you have to lose?” The answer is everything! Trump’s lack of knowledge or experience or solutions would be bad enough. But what he’s doing here is more sinister. Trump is reinforcing harmful stereotypes and offering a dog whistle to his most hateful supporters. It’s a disturbing preview of what kind of President he’d be. A man with a long history of racial discrimination, who traffics in dark conspiracy theories drawn from the pages of supermarket tabloids and the far reaches of the internet, should never run our government or command our military. If he doesn’t respect all Americans, how can he serve all Americans? Now, I know some people still want to give Trump the benefit of the doubt. They hope that he will eventually reinvent himself – that there’s a kinder, gentler, more responsible Donald Trump waiting in the wings somewhere. After all, it’s hard to believe anyone – let alone a nominee for President of the United States – could really believe all the things he says. But the hard truth is, there’s no other Donald Trump. This is it. Well, throughout his career and this campaign, Donald Trump has shown us exactly who he is. We should believe him. Their applications would be marked with a “C” – “C” for “colored” – and then rejected. Three years later, the Justice Department took Trump back to court because he hadn’t changed. The pattern continued through the decades. State regulators fined one of Trump’s casinos for repeatedly removing black dealers from the floor. No wonder the turn-over rate for his minority employees was way above average. He promoted the racist lie that President Obama isn’t really an American citizen – part of a sustained effort to delegitimize America’s first black President. In 2015, Trump launched his own campaign for President with another racist lie. He described Mexican immigrants as rapists and criminals. And he accused the Mexican government of actively sending them across the border. None of that is true. Oh, and by the way, Mexico’s not paying for his wall either. If it ever gets built, you can be sure that American taxpayers will be stuck with the bill. Since then, there’s been a steady stream of bigotry. The man who today is the standard bearer of the Republican Party said a federal judge was incapable of doing his job solely because of his heritage. To this day, he’s never apologized to Judge Curiel. But for Trump, that’s just par for the course. This is someone who retweets white supremacists online, like the user who goes by the name “white-genocide-TM.” Trump took this fringe bigot with a few dozen followers and spread his message to 11 million people. The Trump campaign also selected a prominent white nationalist leader as a delegate in California. They only dropped him under pressure. When asked in a nationally televised interview whether he would disavow the support of David Duke, a former leader of the Ku Klux Klan, Trump wouldn’t do it. Only later, again under mounting pressure, did he backtrack. And when Trump was asked about anti-Semitic slurs and death threats coming from his supporters, he refused to condemn them. Through it all, he has continued pushing discredited conspiracy theories with racist undertones. He suggested that Ted Cruz’s father was involved in the Kennedy assassination. Perhaps in Trump’s mind, because he was a Cuban immigrant, he must have had something to do with it. Of course there’s absolutely no evidence of that. Just recently, Trump claimed President Obama founded ISIS. And then he repeated that nonsense over and over. His latest paranoid fever dream is about my health. All I can say is, Donald, dream on. This is what happens when you treat the National Enquirer like Gospel. It’s what happens when you listen to the radio host Alex Jones, who claims that 9/11 and the Oklahoma City bombings were inside jobs. He said the victims of the Sandy Hook massacre were child actors and no one was actually killed there. This man wants to be President of the United States. I’ve stood by President Obama’s side as he made the toughest decisions a Commander-in-Chief ever has to make. In times of crisis, our country depends on steady leadership… clear thinking… and calm judgment… because one wrong move can mean the difference between life and death. The last thing we need in the Situation Room is a loose cannon who can’t tell the difference between fact and fiction, and who buys so easily into racially-tinged rumors. Someone detached from reality should never be in charge of making decisions that are as real as they come. It’s another reason why Donald Trump is simply temperamentally unfit to be President of the United States. Now, some people will say that his bluster and bigotry is just over-heated campaign rhetoric – an outrageous person saying outrageous things for attention. But look at the policies Trump has proposed. They would put prejudice into practice. And don’t be distracted by his latest attempts to muddy the waters. He may have some new people putting new words in his mouth… but we know where he stands. He would form a deportation force to round up millions of immigrants and kick them out of the country. He’d abolish the bedrock constitutional principle that says if you’re born in the United States, you’re an American citizen. He says that children born in America to undocumented parents are, quote, “anchor babies” and should be deported. And he’d ban Muslims around the world – 1.5 billion men, women, and children –from entering our country just because of their religion. Think about that for a minute. How would it actually work? People landing in U.S. airports would line up to get their passports stamped, just like they do now. What if someone says, “I’m a Christian,” but the agent doesn’t believe them. Do they have to prove it? How would they do that? Ever since the Pilgrims landed on Plymouth Rock, America has distinguished itself as a haven for people fleeing religious persecution. Under Donald Trump, America would distinguish itself as the only country in the world to impose a religious test at the border. Come to think of it, there actually may be one place that does that. It’s the so-called Islamic State. The territory ISIS controls. It would be a cruel irony if America followed its lead. Don’t worry, some will say, as President, Trump will be surrounded by smart advisors who will rein in his worst impulses. So when a tweet gets under his skin and he wants to retaliate with a cruise missile, maybe cooler heads will be there to convince him not to. But look at who he’s put in charge of his campaign. Trump likes to say he only hires the “best people.” But he’s had to fire so many campaign managers it’s like an episode of the Apprentice. The latest shake-up was designed to – quote – “Let Trump be Trump.” To do that, he hired Stephen Bannon, the head of a right-wing website called Breitbart.com, as campaign CEO. That one came shortly after the Charleston massacre, when Democrats and Republicans alike were doing everything they could to heal racial divides. Breitbart tried to enflame them further. Bannon has nasty things to say about pretty much everyone. No wonder he’s gone to work for Trump – the only Presidential candidate ever to get into a public feud with the Pope. According to the Southern Poverty Law Center, which tracks hate groups, Breitbart embraces “ideas on the extremist fringe of the conservative right. Racist ideas. The de facto merger between Breitbart and the Trump Campaign represents a landmark achievement for the “Alt-Right.” A fringe element has effectively taken over the Republican Party. This is part of a broader story — the rising tide of hardline, right-wing nationalism around the world. Just yesterday, one of Britain’s most prominent right-wing leaders,Nigel Farage, who stoked anti-immigrant sentiments to win the referendum on leaving the European Union, campaigned with Donald Trump in Mississippi. Farage has called for a ban on the children of legal immigrants from public schools and health services, has said women are quote “worth less” than men, and supports scrapping laws that prevent employers from discriminating based on race — that’s who Trump wants by his side. The godfather of this global brand of extreme nationalism is Russian President Vladimir Putin. In fact, Farage has appeared regularly on Russian propaganda programs. Now he’s standing on the same stage as the Republican nominee. Trump himself heaps praise on Putin and embrace pro-Russian policies. He talks casually of abandoning our NATO allies, recognizing Russia’s annexation of Crimea, and of giving the Kremlin a free hand in Eastern Europe more generally. American presidents from Truman to Reagan have rejected the kind of approach Trump is taking on Russia. All of this adds up to something we’ve never seen before. Of course there’s always been a paranoid fringe in our politics, steeped in racial resentment. But it’s never had the nominee of a major party stoking it, encouraging it, and giving it a national megaphone. Until now. On David Duke’s radio show the other day, the mood was jubilant. “We appear to have taken over the Republican Party,” one white supremacist said. Duke laughed. There’s still more work to do, he said. No one should have any illusions about what’s really going on here. The names may have changed… Racists now call themselves “racialists.” White supremacists now call themselves “white nationalists.” The paranoid fringe now calls itself “alt-right.” But the hate burns just as bright. And now Trump is trying to rebrand himself as well. Don’t be fooled. We know who Trump is. A few words on a teleprompter won’t change that. This isn’t just about one election. It’s about who we are as a nation. It’s about the kind of example we want to set for our children and grandchildren. Next time you watch Donald Trump rant on television, think about all the kids listening across our country. They hear a lot more than we think. Bullying and harassment are on the rise in our schools, especially targeting students of color, Muslims, and immigrants. We wouldn’t tolerate that kind of behavior in our own homes. How can we stand for it from a candidate for president? This is a moment of reckoning for every Republican dismayed that the Party of Lincoln has become the Party of Trump. It’s a moment of reckoning for all of us who love our country and believe that America is better than this. Twenty years ago, when Bob Dole accepted the Republican nomination, he pointed to the exits and told any racists in the Party to get out. We need that kind of leadership again. Every day, more Americans are standing up and saying “enough is enough” – including a lot of Republicans. I’m honored to have their support. And I promise you this: with your help, I will be a President for Democrats, Republicans, and Independents. For those who vote for me and those who don’t. Because I believe we are stronger together. It’s a vision for the future rooted in our values and reflected in a rising generation of young people who are the most open, diverse, and connected we’ve ever seen. Just look at our fabulous Olympic team. Like Ibtihaj Muhammad, an African-American Muslim from New Jersey who won the bronze medal in fencing with grace and skill. Would she even have a place in Donald Trump’s America? When I was growing up, Simone Manuel wouldn’t have been allowed to swim in the same public pool as Katie Ledecky. Now they’re winning Olympic medals as teammates. So let’s keep moving forward together. Let’s stand up against prejudice and paranoia. Let’s prove once again, that America is great because is America is good. Thank you, and may God bless the United States. First they backed Jeb, then Marco, then Cruz, and now, it looks like Wall Street is pinning their hopes on Hillary. And most of America hopes he succeeds. The anger behind Donald Trump is also anger against the current capitalism which has emasculated the American worker. You add Donald’s followers to Bernie’s followers and you have a majority of America who wants some very big changes to quickly affect the daily lives of 90% of Americans… They need more income. The capitalist system of today is bigger than America… Most of America’s profits are quickly moved off-shore doing Americans no good for all the work they’ve done for their bosses. American workers are past their breaking point and only two candidates understand and address their issues. Donald and Bernie. There are opposite differences in addressing the same theme. One is diverting attention away from those big businesses by pointing to Mexicans, Muslims, and Megan (something with M’s?). The other is aiming to control big business by putting it back into the box from which it escaped during George W Bush’s presidency…. But depending on who you mistrust, both are doing exactly the same thing in the grand scheme of things: organizing against today’s form of capitalism. So, with Wisconsin going to Bernie, there is now some fear that New York may do the same. And that has unleashed all the tricks to blank out both Bernie and Donald so regular Americans continue to be blocked from any say in how their government gets run… something that keeps Wall Street up at night. I read the Daily News transcript and you should too. You will understand that headlines quite often these days, do not an accurate description of the article, make. I was very pleased with Bernie’s answers and was rather shocked that some have said otherwise…. The leader of the negative articles is none other then mega-giant Amazon.Com’s own newspaper, the Washington Post… Remember this paper is owned by Jeff Bezos, 5th richest Forbes designated person in the world, who is worth $52 billion. So, imagine you had $52 billion in assets… Would you attack someone who would cost you money??? Or someone who would give you money?? Here are the Washington Post’s flurries off that great interview (read the transcript)-=- remind one of Fast and Furious? Writers for The Atlantic, Vanity Fair, CNN, Slate and Talking Points Memo concluded as well that Sanders had botched the interview. But the transcript shows a different story…..Sanders’s conversation with the Daily News was more nuanced than some of the criticism might suggest. Here is one example…. Sanders was faulted for not having formed an opinion on a recent ruling in federal court. “It’s something I have not studied, honestly,” he said. That federal court ruling, for instance, remains under seal, and experts on the financial sector said there were additional reasons that Sanders couldn’t give precise answers to several of the questions that were put to him. The same applies to Sanders not knowing the specific statute for prosecuting banks for their actions in the housing bubble. Knowingly passing off fraudulent mortgages in a mortgage backed security is fraud. And the fact that Sanders didn’t know a specific statute, who cares? How many people know the specific statute for someone who puts a bullet in someone’s head? It’s murder. Specific statute? Are you serious? Although he did not know, he did argue that the federal law enforcement should devote more manpower to investigating the largest financial firms to determine whether any particular laws were violated, something Clinton has also promised to do, putting both of them at odds with Obama, who chose instead to seek large payments to settle, instead of aggressively prosecuting what could be very involved, risky and unsuccessful at the Supreme Court. With the exception of the subway token thing, gracefully ending with an image of Bernie jumping a turnstile and gracefully eluding the subway police, it often appeared that the Daily News simply had inexperienced reporters asking vaguely open questions to which Bernie was hearing different parts…. Bottom line is that reading the entire transcript, makes Bernie not someone out of touch with the big picture of running America; which means that those saying he was, ARE out of touch with how America needs to be run…. Look. Mom says: Be home for Thanksgiving… She doesn’t say: get out of work early, pack the night before, take the number 5 bus to the station at 7:45; get on the 8:11 train to Philly and get of at Suburban station and take at 9:22, the 102 bus north…. Bernie got it right… Bezos obviously has a $52.2 billion agenda…. If you are smart (Allan Loudell gets fooled every time), don’t believe any media this campaign, but use them to read the transcripts…. for you are smarter than they are. Brilliant strategy for any voter: go the source; ignore headlines and commentary. Gate’s Slams Biden the headline read… In it the paper went directly to the money quote by Bob Gates: “I think he has been wrong on nearly every major foreign policy and national security issue over the past four decades.” Four decades is a long time. Going back from today it would begin in 1974. Of course making decisions invites controversy. In any decision, there are those who agree, those who don’t. The only effective judge of any action plan, is how it stands up historically. One can be on the least popular side, and be proven right as perhaps one considers those who protested the Vietnam War in the 60’s and 70’s for example. Or one can be on the more popular side and be proven wrong, such as our move into the War in Iraq in 2003. I quickly found an account that outlined Biden’s foreign policy over 4 decades and simply listed what was forthcoming. You can judge for yourself, the right and wrong choices Biden made… I predict you will find that unless you yourself are one who consistently chooses wrong when it comes to our nation’s future (as in Conservative), you will find that Gate’s exaggeration is a bit overblown…. Biden in the beginning focused on arms control issues. In response to the refusal of Congress to pass the SALT II, Biden took the initiative to meet the Soviet Foreign Minister Andrei Gromyko, educated him about American concerns and interests, and secured several changes to address objections of the Foreign Relations Committee. When the Reagan administration wanted to interpret the 1972 SALT I Treaty too loosely in order to allow the Strategic Defense Initiative (Star Wars) to proceed, Biden was who argued for strict adherence to the treaty’s terms. Biden clashed again with the Reagan administration in 1986 over economic sanctions against South Africa. Reagan was against them. Biden for. Biden was co-chair of the NATO Observer Group in the Senate. Biden met with some 150 leaders from nearly 60 countries and international organizations; three times he chaired the Subcommittee on European Affairs..
Once the Bosnian War broke out, Biden was among the first to call for the “lift and strike” policy of lifting the arms embargo, training Bosnian Muslims, and supporting them with NATO air strikes, and investigating war crimes. The Bush administration rejected an effort Biden undertook with Senator Richard Lugar to pass a resolution authorizing military action only after the exhaustion of diplomatic efforts before the Bush invasion of 2003. Biden argued repeatedly that the Iraqi war should be internationalized, that more soldiers were needed, and that the Bush administration should “level with the American people” about the cost and length of the conflict. Biden’s stance had shifted, and Biden opposed the troop surge of 2007, saying General David Petraeus was “dead, flat wrong” in believing the surge could work…. Biden was a leading advocate for dividing Iraq into a loose federation of three ethnic states…. similar to how the US is formed. Biden lost an internal debate to Secretary of State Hillary Rodham Clinton regarding his opposition to sending 21,000 new troops to the war in Afghanistan. Joe Biden became the administration’s point man in delivering messages to Iraqi leadership about expected progress in the country. Biden’s January 2010 visit to Iraq in the midst of turmoil over banned candidates from the upcoming Iraqi parliamentary election resulted in 59 of those candidates being reinstated by the Iraqi government two days later. In a controversy arising over how much influence Russia still had on a global scale, Secretary of State Clinton quickly disavowed Biden’s remarks disparaging Russia as a power. Biden led the successful administration effort to gain Senate approval for the New START treaty. So …. why the contrarian role announced by Gates? This may well be the reason. Simply based on an apolitical history across his lifetime, it now seems obvious that when someone in ignorance makes a disparagement over the effectiveness of one former Senator and current Vice-President Joe Biden , what they are really saying, is a rather negative commentary about a lack of their own astuteness, and not a disparagement about the real Joe Biden…. Hold It! Did You Know? It Is Your Right To Form A Union! The now famous high stepping Wal*Mart video mentions that point…. Now, the meme of bashing Wal*mart and fast foods has gotten a little blaze and to be honest, when I first saw the flash mob at Walmart on the national sites, as a person with little time, I passed. The second answer was… “of course I did.” which made me more intrigued by my original answer. Why on earth did I think it was bad for these people to interrupt business as usual to demonstrate for something affecting I think, one person? How many others out there would say “no” … How many others out there really don’t know it is their right to form a union? That anyone can form a union? It is legally protected. Oh, they can threaten to fire you if you join… And they can fire you…. But if they do… you can sue… and even better, under current law, you can sue them and win. Win big! You can make them pay you for all back wages you lost. So finacially it is just like you were working but having the entire time off. You can make them pay all your damages, including late fees on bills you couldn’t pay because the illegally fired you. You can make them pay interest on all loans you took out to live on, even if they came from family. If you Dad gives you a loan at 1000% interest, they have to pay that… and to your Mom, your brothers, your sisters, your aunts, and uncles… Your whole family and friends can get rich off them because they fired you for forming a union! The business may respond to the legal judgment , “Screw you , we are closing”. But if they close they will still have to pay you for all the damage they cause you because they fired you for forming a union… You still win! And win BIG! Some may think forcing a union on a business is unfair. Racist states often use this argument. Why should White owned businesses pay more for black people’s labor? That is why ALEC (in Delaware associated with Patty Blevins) was invented: to protect White Businesses’ interests. And still unfortunately, in some states, there were enough white people still agreeing that black people as well as to those whites who associate with them, should be paid inferior wages,so much so that with ALEC’s help, enough votes were mustered to pass state anti-union laws.. But historically there were laws that once said: slavery was legal. Despite bad law, morally it was still everyone’s right to be free…. It is your right to form a union. Existing law is crystal clear. Why was this decided? What is the moral argument behind it? Simple. You have to eat. Bottom line. If someone says I have to pay you $6.00 an hour because I’m not making enough money, and you can’t get money anywhere else, you work for $6.00 and hour. If he counters that he can only pay $5.00 an hour, and you can’t make money anywhere else, you will do his bidding for $5.00 an hour. Why not $4 then? Why not $3 then? Why not $2 then? Why not $1 then? Why not .25 cents then? There is no bargaining chip in your favor… Your employer if legally allowed, would pay the lowest rate possible to still have employees. When there are more employees than positions, wages could drop very low…. because you have to eat. And so they agreed: “If we make our employers have disposable income, they can buy our products and we can again make money”. So the legal basis was almost unanimously approved by both businesses and labor, to make the right to strike just that. a basic human right protected by the full force of the law… Simply because paying workers higher wages is good for increasing overall demand. and that is what drives economies forward. Basically, a union is the answer to this counter argument: “why should you, the investors, get all the money off our labor, and we get none?” Admittedly both of us should get something decent from our arrangement…. So I encourage all reading this to now begin talking up unions in your workplace… Because if you get fired for any reason afterwards, you can blame it on the legal right to form a union…. it is like a wonderful vacation in which you still will get paid, probably even more than if you’d put up with the bosses crap the whole damn time….! It really is your “right.” and it is protected by law. Now, go get them tigers! Oh, My! He Just Fired The Guy…. Obama just fired the acting director of the IRS… This person was not even part of the IRS when allegedly this Tea Party business occurred. He became director just after last year’s election. He found out about the problem at the same time as did us, And Obama fired him. Wow. For you see, nothing really wrong was done. The group who were looking at Tea Party applications have a job to do.. The exact purpose of the IRS office in question IS to look at political groups. Specifically, to weed out purely political groups that promote or oppose candidates from obtaining a tax status that’s supposed to go to nonprofit educational organizations. The crime of the IRS agents in Cincinnati? They were doing their job. But the targeting! Why wasn’t Think Progress or George Saros targeted to? Behind all this are the staggering numbers. Out of thousands of applications, only a handful were rejected. You know what happens while a nonprofit organization is waiting to get this approval? They get to operate as a nonprofit organization. The harm caused by this action is exactly zero…. These are agents doing their job. They responded to an unusual influx of groups with political language in their applications all going after a designation that excludes groups that carry out many political actions. The only scandal here is that this is being reported as if the IRS did something wrong in injecting itself into politics. The law requires that the IRS inject itself into politics. Don’t like it? Change the law. Don’t attack the people trying to enforce it. And now, the acting director is fired….Just like that. over something that took place over which he no control, no input, and no knowledge….. and wasn’t even in charge when it happened…… That person has retired. That is why it was done. It was not done for the past. It was not done for the present. It was done because without doing it, the IRS would always be tainted with the memory. How do I know this? Because someone who happened to be the IRS director at the wrong time this news let out, was made accountable…. No one is going to do it again…. This is why Obama is so great. I remember George HW Bush sticking with LA police commissioner Gates, who without doubt, was running a racially intimidating police force. Not acting on that cost him the election.. Firing innocent people who do a good job, is not easy. It is especially hard when one fires someone to save the ship, even though that person has no guilt, no accountability, but is in the wrong place at the wrong time..
Bad as it was, it had to be done to save the accountability and honor of the United States of America. We’ve heard from Delaware Politics and national Tea Party candidates how corrupt the Democrats and Obama are. In one swift move, what we Democrats always knew is now proven. Obama don’t stand for that. You can go to bed now. Our country is in safe hands… Honesty has taken the upper hand. Today is School Board Elections…Polls are open 10-8… If anyone is sponsored by Markell or Rodell or RTTT or WSFS, don’t vote for them.. If anyone is sponsored by DSEA, they are on the students side. They are safe. Can The NRA Now Be Classified As A Terrorist Group? There is a dual application of interpretation going on. The new head of the NRA James Porter, an attorney who defends gun manufactures in lawsuits, is quoted as calling our president a fake president; he once termed the Civil War of Southern Disobedience, as the “War of Northern Aggression,”; he believes that one of our highest priorities should be to train and arm all our citizens so that, when the time comes, they can “fight tyranny” and impose their will upon the rest of the population; who believes white is right, brown goes down, and guns are the way to achieve that end….. He is now the new head of the NRA, an organization once dedicated to outdoor sportsmen and hunters. If he were Muslim, he’d be under surveillance for fear of blowing up people at a Marathon.. James Porter’s words are more inciteful than any mullah. Either we back off all Muslims, or we treat the NRA as we would Al Qaeda under Osama Bin Laden…. Not to do so is simply continuing a double standard….. The NRA … IS the new Muslim…. Anyone who condones Newtown Connecticut as a great secret United States of American plot is simply put, … untrustworthy. It is time to round up all NRA members in put them in internment camps for observation just as we did for the Japanese during WWII..
America gets up in arms when it’s privacy issues are at stake. How dare you know that about me! However when someone slips through our net and blows up a building or car, they exclaim, how did you not catch him in time? Soon to be announced if not already out there, is our nation’s now no longer classified Trap Wire System. In the reports of its inception this package was held up as the ultimate surveillance tool. Cameras across the country would capture data from cities, highways, tolls, parks, public arenas, and everywhere else there is a camera, encrypt the data, then send it to a central point where it gets incorporated with all other data already compiled on every citizen. That data including public on line events such as dating services, chat rooms, Facebook, Twitter, Linkedin, as well as corporate files, employee rosters, and the vast cesspool of corporate data gleaned each and every time you use your credit card. On every adult citizen, a computer can spit out a file of facts that even that citizen doesn’t know… The computing power is unparalleled. You are sitting at the stoplight, and for no reason a camera goes off, you think weird, no one tripped it. and instantly your face has been identified, your file pulled, and a program knows you buy Colgate toothpaste 39% of the time. And it knows you are on Zoloft. Your credit score is 593. And you are cheating on your spouse of 27 years with a 19 year old who gets something from Victoria Secret every month…..
A song comes on the radio and your mind jumps to it and you go on never thinking of that random event again……. Of course there is the other side of the story. You pull up to the light right beside the dufus mentioned above. The same thing happens. You wonder too. Your picture triggers an alarm because your image was last seen in the lower Philippines having been traced there from Manila before paying for the boarding of a private boat off Gov. Lim Ave, then going dark 18 months ago. The alarm is because you were once an acquaintance on the third level of a Detroit sheik who propagated militancy. The file shows you worked with explosives on construction sites, you were terminated at one time being blamed for some missing C4. You denied you had anything to do with it. The camera notes that your car is low in back, and alerts other cameras on the route your are traveling that you will soon be entering their view. Your facebook page shows you liked Iran and support Assad of Syria. Your high school psychological profile says you were quiet and brooding. Your license plate is registered to a car reportedly at the gas station on Rt.273 undergoing lengthy repairs. You are unmarried. You don’t date, and your credit card has a large cash balance, yet you spend very little and that is only on food, gas, and a furnished apartment in Christiana Meadows. As you drive by a transponder, your new phone signal gets captured, and all your calls are now being pulled up. You spoke with a person of high interest, 2 times this morning, for a length of one minute each. Your visage is updated to all local cameras and all transportation portals, and put at the top of each face recognition program. Someone is dispatched to scout your apartment. You see. That is the dilemma. We enjoy our safety, and abhor our loss of privacy. If you haven’t noticed already, on your emails sometimes you have these buried within the routing: Abraxas and the others you see will say, Stratfor…. Bloggers are very used to seeing these on a rather regular basis. They are everywhere across the net. One thing noticeable during the Olympics was that the Brits live this way all the time. They are used to it and prefer the cameras and intrusive software over a coordinated attack on their trains. And no one can blame them. But what the Brits have, and we don’t, is a set of rules regarding this capturing of information. If someone violates this code as did Murdoch, then the ramifications are severe; perhaps bringing down an entire corporate empire. The CEO, Vice President, and quite a few others all charged with illegal actions. And that is the lesson we need to take. Accept the surveillance but know that if anyone, anyone breaks the code of privacy… you are going to be filthy rich for the rest of your entire life at their or their employer’s expense…. For if that is truly the case, going back to the original story up top, if you got busted for your too hot to fail 19 year old lover, and lost your spouse, for $83 million, you really wouldn’t mind too much… My bet? You would see it as a blessing in disguise. And if you still loved your spouse, don’t worry. When you are worth $83 million, she won’t go far. This has to become the future of surveillance. Here is why. I’ll use Facebook as an example. I can always tell when one a friend has to hand over their password to their employer. Whereas they used to be so lively, responsive, and fun, they suddenly stop posting anything showing their personality. Their presence on line becomes reduced to “look at my kid”; “here is my dog”. Whereas you used to be able to talk to them about their spouse, their parents, how they were feeling, how they liked their job, how they were doing in the lover department, how their head was, what hopes and dreams they possessed, how drunk they got, suddenly their presence is as chilled as someone passing Checkpoint Charlie in the 60’s. There is a rigidity that they must conform to. There is a corporate mentality that they must express, and most deal with it by staying silent. That is not what America is about. America is about freedom, about life…. about liberty….. and about the pursuit of happiness…… What once was open air on the internet is now poisoned with carbon particles, so much so that it is hard to breathe. We can’t lose our nation’s fun-loving identity. And we can’t stop protecting ourselves by our newer and newer technology. So, what we can do (and we can easily do this), is not to constrain the surveillance, but penalize any misuse of the data that gets captured. Really? REALLY? A person should never have a light moment with an acquaintance, one of those few joyous moments we as people treasure forever, because someone they don’t know, someone they never met, might hack into their account, and spread it across the world? That is ridiculous. The internet IS us. If we want a fun moment, we have the right to exercise it.. Back when I was growing up, laws were passed and on the books to control the positions that went on within the bedroom. That has fortunately faded away into being ridiculous. The same needs to happen on the internet. And the easiest way, the simplest way, is to have huge, gigantic fines, ones that are so big they will bankrupt anyone, and everyone who breaches another’s privacy. So what if some entity knows you use Colgate 39% of the time. If no one else ever knows that they know it, as far as impacting anything in the real world, their knowledge of that minutia, doesn’t matter. We need to start the process. We first announce the problem; we offer a solution; we educate the public; we elect responsible legislators, we pressure responsible legislators, we get legislation signed, and then, we relax and really enjoy the rest of our lives. It is past time that our personal privacy be now given a price tag that is equal to what it is worth. Something in the range of tens of millions comes to mind….. Hell, you can get $90 million for spilling hot coffee in your lap….. It was called politics as usual when Rich Krett withdrew from the New Castle County Council President’s race. It was anything but usual. You see, Rich Krett, is head of AFSCME Local 3109. AFSCME has 7000 Democratic employees in Delaware, … Mr Pam Scott, is head of the Realtor’s Association of New Castle County. They have 1900 agents and all of them, all of them are Republicans. Not much help in a Democratic primary…. Something had to be done to stop Rich Krett from going through with his election…. Otherwise the Realtors were out! And so a signature is attached and Rich has no idea how it got there… But, under the Hatch Act, any local officials who in any way receive federal funding are bound by the Hatch Act’s prohibition on seeking political office. Problem is: it often keeps qualified candidates out of the field… sometimes people more qualified than the current office holder…. Hats off to WDEL’s Rick Jensen. In an on air interview with Assistant attorney for New Castle County, Ed Danberg, we heard Ed dancing semantically arouhd Rick’s direct questions. “Ed, you can have my damn job… I’m definitely going to take the job of your boss now!!!! !” …. didn’t happen. Rich obviously needs to work. 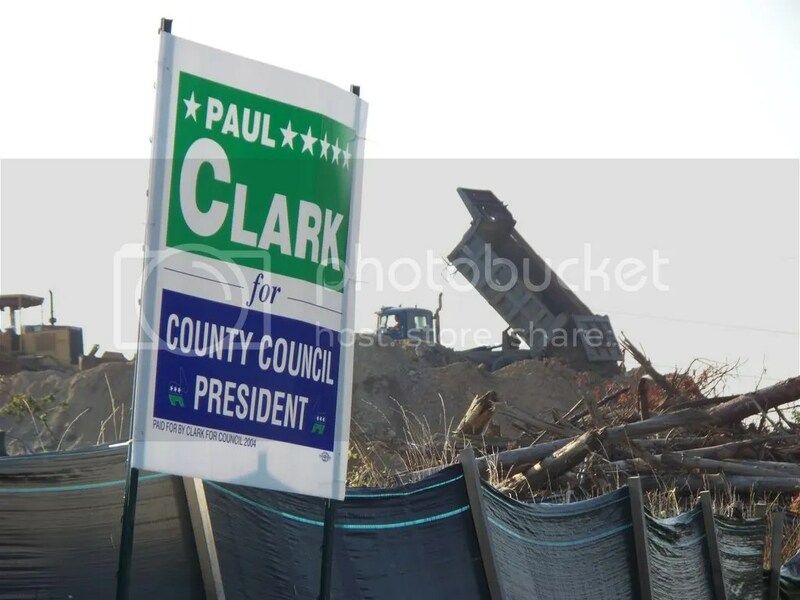 And so Paul Clark does not have a head of the government union running against him in the Democratic Primary…. Although that could be true in an extreme case, it would have to go through a long series of events to make that happen. First, Rich would have to say, I’m challenging this. Then Mr. Pam Scott, would have to say, … you’re right… We are not firing you and not only that.. we are going to be sticking up for you!… Then, the Feds would have to ask the Special Counsel to look in on the situation. She would, and she would have to respond back, that things were completely out of control in New Castle County under the leadership of one Mr. Pam Scott, and that all Federal funding for everything in New Castle County should be frozen…. Ironically on the very day Rich was first contacted by Ed (attorney for Mr. Pam Scott), on the blue carpeted floor of the United States Senate, a bill by Sen. Daniel Akaka (D-Hawaii) and Rep. Elijah Cummings (D-Md), was introduced that would… in the future, EXEMPT ALL LOCAL GOVERNMENT AND STATE GOVERNMENT EMPLOYEES FROM THE HATCH ACT…. The Office of Special Counsel, wants the Hatch Act Overhauled…. Looks like the only people who REALLY care about this ancient piece of legislation, are a crotchety bunch of Realtors, desperate in times of changing political loyalties, to limit any competition………. 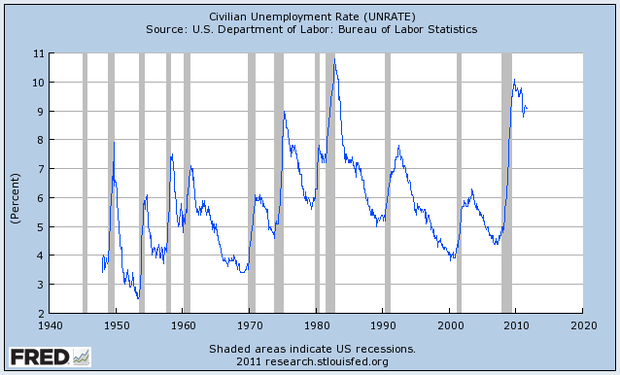 These charts are most telling because they are all timelined with the Recessions and Depressions…. 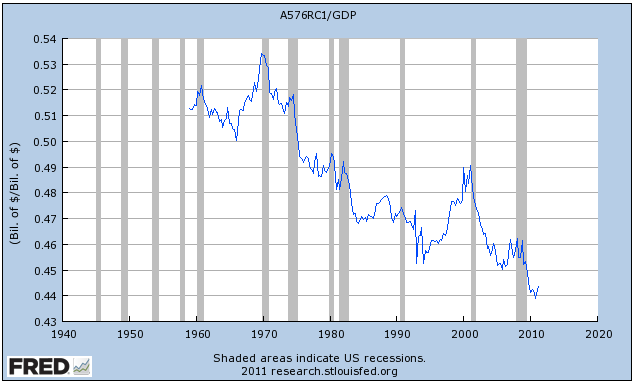 The Seven Charts That Show the Historical Effects of the Romney-Gingrich Policy…..
1. Unemployment is at the highest level since the Great Depression (with the exception of a brief blip in the early 1980s). 2. 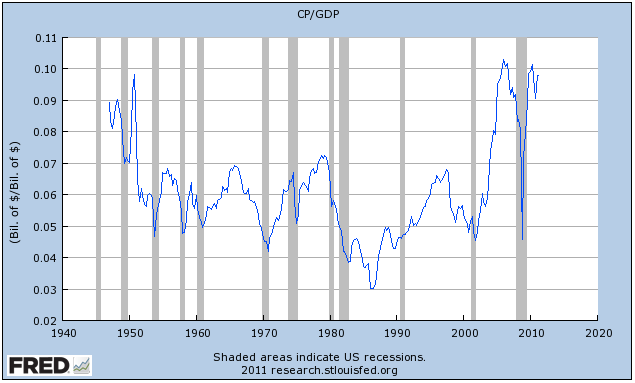 At the same time, corporate profits are at an all-time high, both in absolute dollars and as a share of the economy. 3. Wages as a percent of the economy are at an all-time low. 4. Income and wealth inequality in the US economy is near an all-time high: The owners of the country’s assets (capital) are winning, everyone else (labor) is losing. 5. 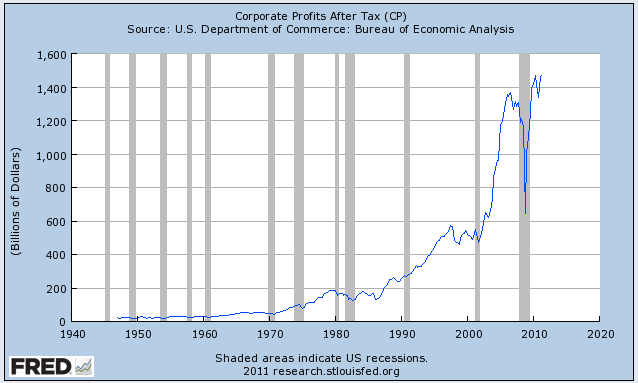 CEO pay and corporate profits have skyrocketed in the past 20 years, “production worker” pay has risen 4%. 6, After adjusting for inflation, average earnings haven’t increased in 50 years. It’s worth noting that the US has been in a similar situation before: At the end of the “Roaring ’20s,” just before the start of the Great Depression. (See some of the charts above). It took the country 15-20 years to pull out of that slump and fix the imbalances. But by the mid-1950s, employment, corporate profits, wages, and inequality had all returned to more normal levels. And the country enjoyed a couple of decades of relatively well-balanced prosperity. But now, everything’s out of whack again. Importantly, the inequality that has developed in the economy over the past couple of decades is not just a moral issue. It’s a practical one. It is, as sociologists might say, “de-stabilizing.” It leads directly to the sort of social unrest that we’re seeing right now. SO, WHY IS NO ONE TAKING REPUBLICANS TO TASK FOR THE RESULTS THEY MADE, INSTEAD, THEY GET TREATED LIKE THEIR PHILOSOPHY COULD BE A VIABLE OPTION?